The combination of sweet brown sugar, punchy dijon mustard, tart lemon and fresh herbs makes a fantastic rub for chicken. It comes together in seconds then you slather it all over a whole chicken and throw it in the oven and supper cooks itself. Seriously SO easy! I like roasting two chickens at a time because I love having shredded chicken on hand as a starter for other recipes during the week. One easy recipe turns into two or three easy recipes. Move oven rack to bottom third of oven and preheat to 425 degrees. Place a rack inside a small roasting pan and pour 1 cup of water in the bottom of the pan. In a small bowl mix together mustard, brown sugar, fresh herbs, garlic, olive oil, salt and pepper to make a paste. Add the lemon zest and mix again. Rub all over the chicken. Place the other half of the lemon inside the chicken and tie the legs together using kitchen string. Place breast side down on the rack and roast uncovered for 30 minutes. Remove chicken from oven and flip over. Add a bit more water to the pan if it has evaporated. Return to oven and roast for 35 to 40 minutes more depending on the size of the bird. If chicken browns too quickly, cover loosely with foil. When cooked, legs should move easily in sockets and the thigh juices should be clear (not pink). 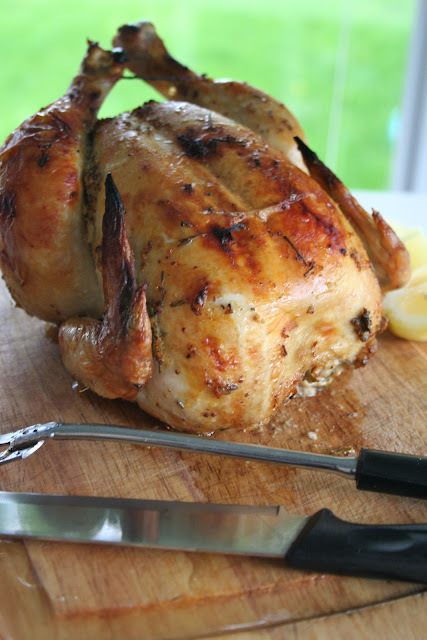 A meat thermometer inserted into thigh (away from the bone) should read 170 degrees. Remove chicken from oven and let rest for 10 minutes before carving. The rub on this chicken is so flavorful! I love the combo of sweet with mustard and the freshness of the herbs. It's possible that the roasted chicken skin is my favorite part, and it's also possible that I sort of kind of steal bites of it while I'm carving the chicken for my family's dinner. Don't tell anyone. Strip all the meat off the bones, and use the carcass to make: Homemade Chicken Stock. You can then make any number of homemade soups with it like: Creamy Summer Vegetable Soup.